Good Morning! I am back in my office “unofficially” trying to catch up on things from being away for the last 5 days. It was an AMAZING weekend. The best Birthday/ Mother’s Day gift a girl could ask for – a weekend away with hubby visiting our daughter, Belinda. I know, you are probably tired of hearing it but I have to share how dreams (and prayers) came true this weekend…..
First, this was our first trip since Rob had congestive heart failure last year so we were not sure what to expect. The 12-hour ride was our first concern but that went off without a hitch on Thursday. First obstacle accomplished! Friday was a lazy day with running errands, visiting the local farmer’s market and dinner made by Belinda. Rob was shocked because he thought all she knew how to cook was mac and cheese or chicken nuggets. It was a great dinner along with hours of just talking and playing with the dogs. Saturday was a DREAM COME TRUE! Yes, we went to the circus which may not seem monumental to anyone else but Rob was having another GREAT day! A yummy breakfast at Biscuit Head where we had a chance to meet some of Belinda’s friends. 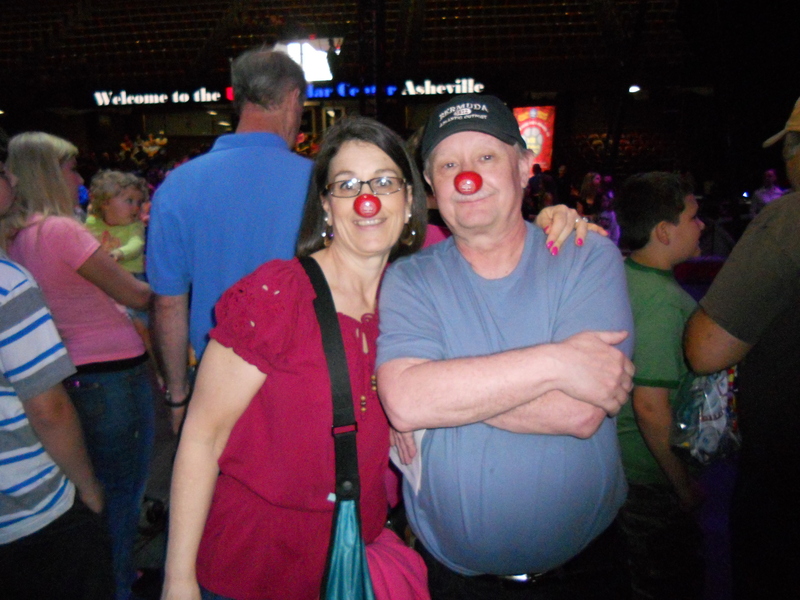 We headed out to the circus early because Caleb (American Idol fame) was making appearances in Asheville (his home town) and we wanted to make sure that we didn’t get caught up in the traffic – no we didn’t get a glimpse at him but we did see the motorcades that were taking him from place to place. On line to get into the circus, Belinda is interviewed by Animal Right Activists who are protesting the circus. She was her usual outspoken self and defended Ringling Brothers then asked them for proof that THIS circus was abusing animals. No hate mail please. To say the least, they went on their way. As we entered the circus, we got there early enough to enjoy the pre-show on the floor of the circus as well as mingle with the performers. I don’t know who was more excited me or the girls. 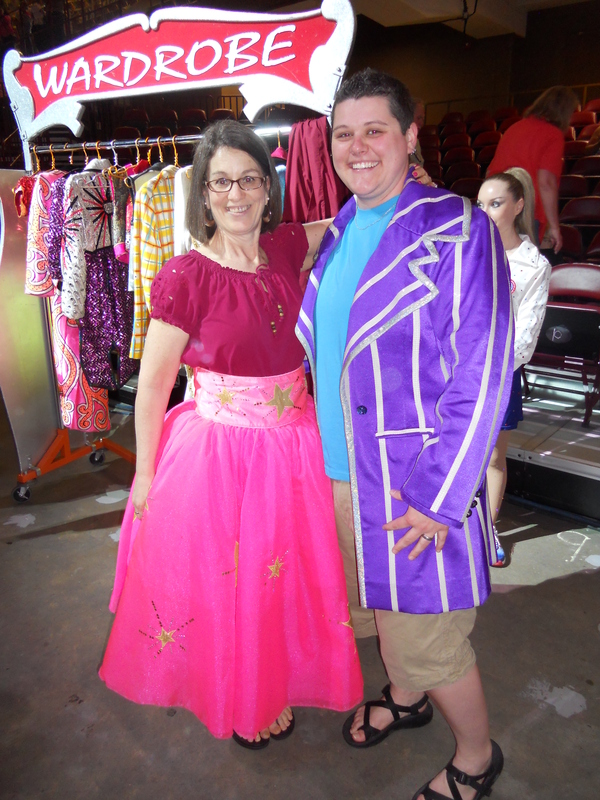 I got to be a princess in the circus while Ashley tried on the Ring Master’s coat. You think we could be clowns in the circus? Belinda was on a mission – she wanted to see Duchess up close and personal. She LOVES elephants. As we are looking at the animals backstage – she thinks she recognizes the girl working with the dogs. 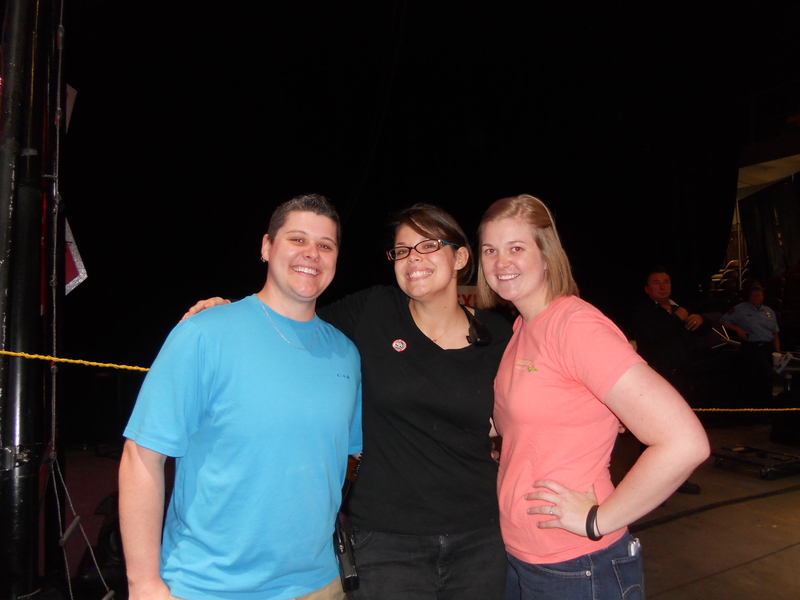 She hesitated but after some nudging from me – she asked her if she went to WCU? YES AND she remembered Belinda. Theresa told Belinda that she would talk to her as soon as she was done. Can you feel the excitement mounting? As soon as Theresa got done caring for the dogs, she came and got ALL of us to take us backstage to meet Duchess. OMG! Duchess is 43 years old and has been with the circus since she was 3 years old. Belinda realized that she has been watching this elephant grow up every year that she has attended a circus. It was AWESOME! 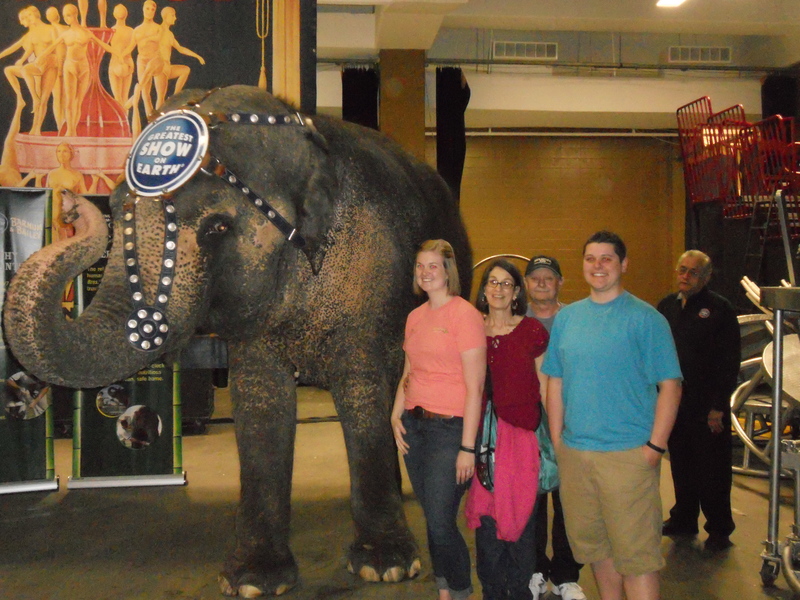 Theresa applied for the job with the circus as a Vet Tech on a whim and she got it! She LOVES it! Travels 46 weeks a year with the circus (and her dog) and is based in Florida. Just an hour before, Belinda was interviewed by an Animal Rights group only to find out that one of the Vet Techs is a WCU alumni who LOVES animals. The girls made plans to stay connected through Facebook so that they can visit with each other again in either NC or Florida. Another item off Belinda’s bucket list! So, the moral of the story – besides having an AMAZING unforgettable day – reach for the stars for you never know who may be there to help you along. Dreams do come true no matter how silly they may seem to someone else, they are YOUR dreams. Share YOUR dream…Have a ThirtyOne-derful day!